Since launching Sunrise in February 2013, Pierre Valade, former UX designer at Foursquare, had a busy year. Started as an iPhone app aimed at reinventing digital calendars and how people manage their schedules, Sunrise quickly gained 250,000 users, added support for Exchange calendars, and expanded to the web, iPad, OS X, and Android. Valade and his team listened to Sunrise's userbase and added better invitation management and Google Maps previews, but, more importantly, they had to deal with a data breach that forced them to switch to a new token-based authentication for iCloud. More recently, Sunrise launched native app integrations, building on the founders' vision of a calendar that extends beyond events with a developer platform to let anyone to build services connected to Sunrise. Valade wants digital omnipresence and modern features to be key elements of Sunrise, which is still a free app with over $8 million raised in funding thus far. And today, with the launch of version 2.5 on the App Store, Valade is hoping that new functionalities such as search, push for Google Calendar, and integration with Todoist will continue to offer the value that, according to his plan, should make Sunrise an app people can't work without. “We've always wanted to build the best product we can, and this has really paid off in the past few months”, Valade told me over Skype in an interview last week. I can't tell if trying Sunrise will pay off for me eventually, but Valade has a point when he argues that cross-platform availability and constant addition of third-party integrations have made people eager to recommend Sunrise or curious to check it out. That's exactly how I rediscovered Sunrise over the course of this summer. As MacStories readers may have noticed, I've taken on a few more projects during the past year – another podcast, more frequent app reviews, a complete redesign of the site, a better exercise routine and, last month, a weekly newsletter. Writing for MacStories has been my primary job for the past five years, but what started as a series of side-hobbies has now evolved into a collection of serious, also-primary projects that need my full attention. Last year, when I didn't have a weekly commute between Viterbo and Rome, a new apartment, and when writing for MacStories was my only regular commitment, I thought that Reminders and iCloud Calendar would be enough for me. And they absolutely were just fine for what I needed. But as 2014 rolled in and new weekly projects and tasks began to appear, I started feeling that something in my schedule wasn't right: I was failing to add new tasks, I forgot about meetings and deadlines, and I always felt overwhelmed when I had to find the information I needed in several different places. I reached the tipping point in June, just after WWDC, when I realized that my time management habits were due a complete overhaul: I needed to set up clear boundaries for time spent on research, writing, email, meetings, and personal life. I won't pretend that digital tools have been the panacea for my schedule – quite the opposite. The most important changes that I made (and that I'm still making and considering) involved discipline and accepting that I have to say “no” sometimes, because, ironically, too much often leads to less quality. Still, when I found friction and complexity in the software I used, I simplified and reorganized – which led me to Todoist as a replacement for Reminders. A year of iCloud Reminders. Todoist is a cross-platform task management service that I chose for its collaboration features, web app, filters, and open API, but I will cover this topic another time. Using Todoist got me back in touch with Valade, who just happened to be testing the Todoist integration that launches today. It was the perfect excuse to try out Sunrise again and see what I missed. Sunrise has a clean design and it's packed with information without being cluttered or confusing. 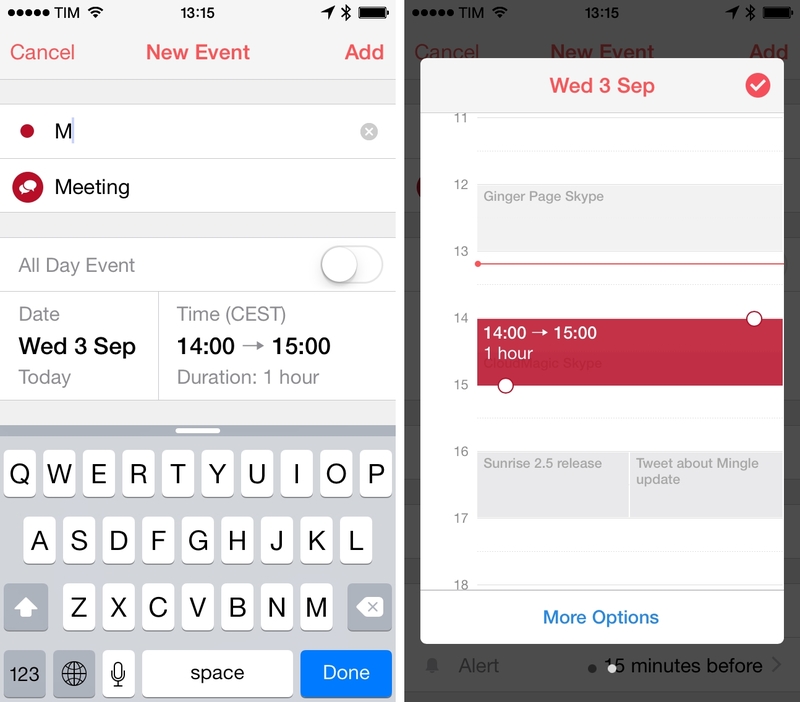 On the iPhone, events and tasks are listed vertically below a two-week preview, while the iPad app comes with a traditional month view. Both apps support iCloud (which I'm still using for my calendar) and display custom icons for different types of events, which is a nice touch to distinguish lunch meetings from Skype conversations at a glance. Both apps can embed Google Maps location previews for events, but only the iPhone app can show local weather forecasts for your morning, day, and afternoon. 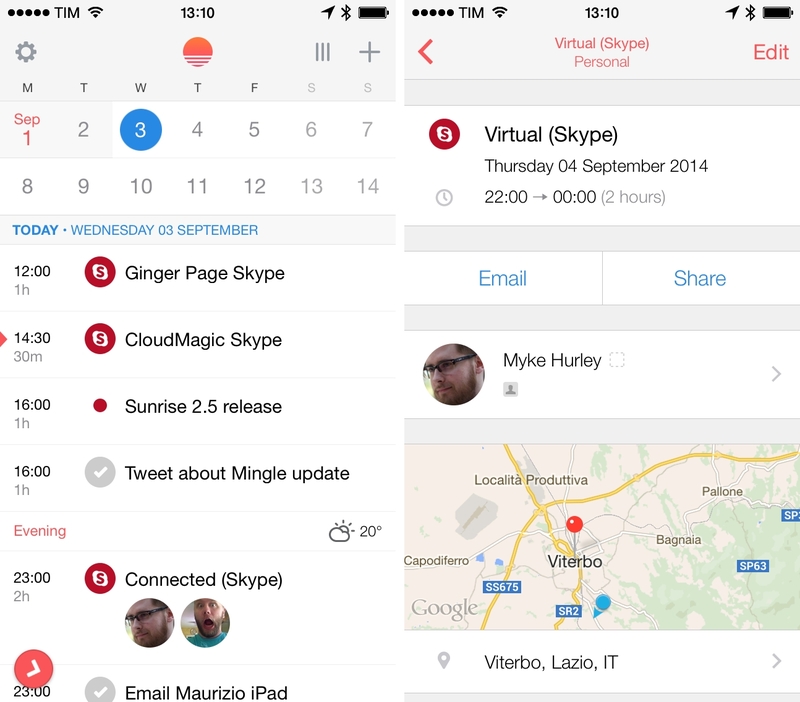 Sunrise's UI for creating events with automatic icon suggestion (left) and day preview (right). There are several design details that stood out to me when using Sunrise. On iOS, locations are previewed using your mapping application of choice (you can set Apple or Google Maps in the Settings) and tapping on the preview will default to loading directions; you can also tap & hold the location to just copy it. On the web app (which mostly mirrors the iPad layout), there is a handy switcher in the top left to load multiple time zones, so you can see what your event at 5 PM means for someone who lives in San Francisco. And when you receive an invitation for an event, you can just swipe to accept it or deny it. The focus of Valade and his team has been building an app that's “seamless and consistent”, but that also “pushes the calendar further than what it used to before”. The big theme of Sunrise is support for third-party integrations – that is, ultimately, what convinced me to install Sunrise and what's being highlighted again today with integration of Todoist tasks inside the calendar. “You shouldn't have to manage your calendar as much as you are doing right now”, Valade said at one point during our chat. Added over the past year and officially launched as a platform in June, Sunrise apps currently include Evernote, TripIt, Foursquare, SongKick, and, starting today, Todoist. Apps are managed as accounts in the app, and each one of them can display a subset of items into your calendar: Evernote, for example, can put reminders alongside events, TripIt can present your travel itinerary, while SongKick can show the concerts you're going to or shows for areas you're subscribed to. “The calendar becomes something that's richer without you having to do any work”, Valade noted, and I agree. I've enjoyed the ability of viewing past check-ins in my calendar without looking through my Swarm feed, and opening Sunrise to load directions to a concert was a natural move when I went to see Arcade Fire in Rome (which, as you know, ended quite interestingly). 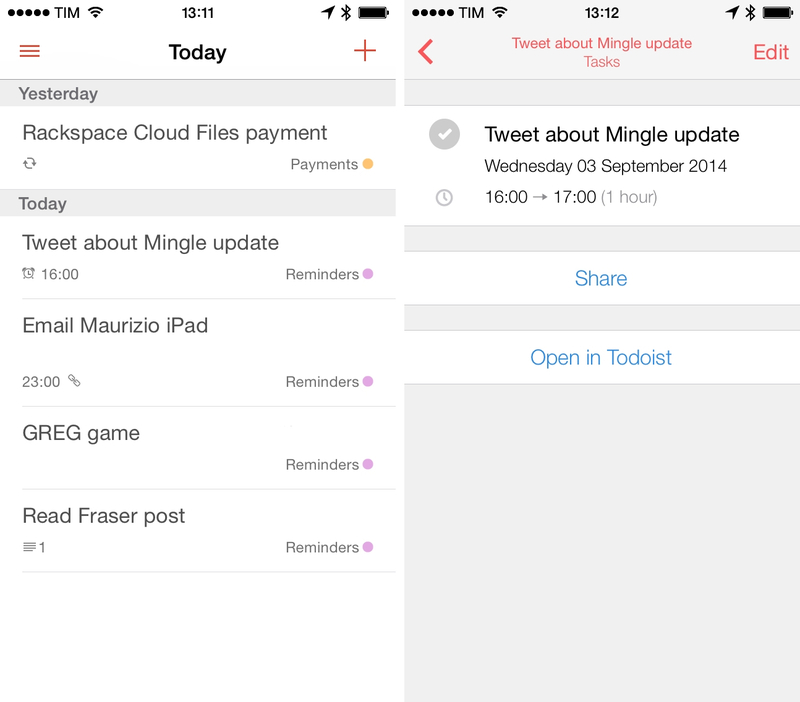 Todoist for iPhone (left) and Todoist tasks in Sunrise (right). Todoist in Sunrise worked well in my tests, but it doesn't feel like a complete integration yet. While other connected apps can inject interactive elements into the calendar, Todoist tasks appear as regular events in Sunrise; just like iCloud Reminders, you can't mark them as complete from the app. Valade is aware of the “one-way thing” that a connected service that puts extra information in a calendar can become (“feeds are a first step”, he said), and he stresses that better interactivity for Sunrise apps will be addressed in the future. It's interesting to imagine how Sunrise could open up its platform to more integrations: in theory, any app or service that has a time-related component could build on top of the Sunrise API and support interactive calendar features, much like app or web developers can optimize their software and content for Twitter Cards. Local weather providers could make their data compatible with Sunrise, team management apps could surface meeting and task information alongside regular events, and fitness trackers could show you when you exercised during the day (similar to Foursquare showing past check-ins). I believe that any kind of task or time-related activity could benefit from integration with the app you're already using to manage your time, but Valade agrees that it might take time to open the floodgates and let everybody create apps for Sunrise. “How do we open up this platform to more people – that's a tricky question and similar to the App Store in the early days”, Valade told me. “We want to keep the quality of apps really high and we have control over the integrations right now, so we don't want to have apps that don't deliver value”. 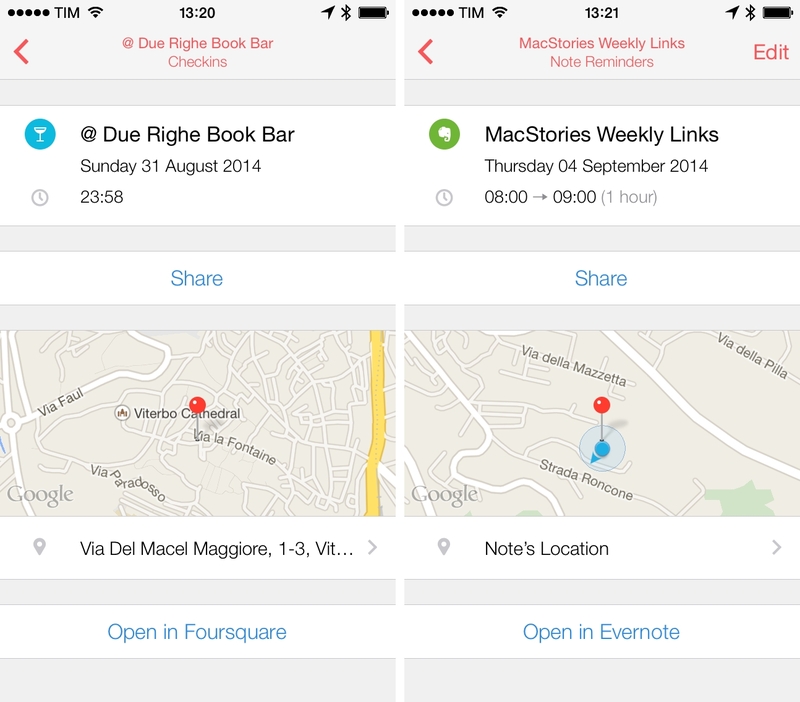 Foursquare and Evernote integration in Sunrise. In its current version, Todoist integration feels incomplete: you can rename tasks, but you can't mark them as done from Sunrise and you can't view people that you assigned tasks to; Sunrise can already pull in relevant Address Book and LinkedIn data for contacts recognized in events, but it can't do the same for Todoist. So while I enjoyed the fact that Todoist is a Sunrise partner, the experience that I got for tasks was comparable to iCloud Reminders into Sunrise: you see them, but you don't have full control over them. I appreciate the fact that you can turn off notifications for individual services enabled in Sunrise (I don't want to get two alerts for the same task), but I'm looking forward to more interactivity in connected apps. In spite of these initial limitations, I found myself coming back to Sunrise as an app that can aggregate my schedule from various sources and present it with a cohesive and consistent layout. Icons and local weather information add context to my calendar; people's faces for birthdays and meetings let me identify priorities easily and visually. I'm still using Fantastical to add events with natural language support (which continues to amaze me), but, with my tasks now on Todoist, using Sunrise makes sense and I subscribe to the vision that calendars should be more than lists of days. A modern calendar should provide intelligent and modern timelines that are connected and interactive, contextual and well designed – particularly for people who manage a lot of projects and collaborate with a team. Sunrise's plan is to make calendars more flexible, and I'm excited about the future of its platform. I discovered a fresh take on calendars with Sunrise, and today's 2.5 update adds powerful features that continue to improve a solid iOS app (search is particularly fast, and Google Calendar push is going to be a big feature for Google users). Sunrise has a long way to go to completely reinvent how people manage their schedules, but it's on the right track. Valade knows that there's still plenty of work left and traditional calendar features that ought to be reimagined. “We want to make Sunrise 10 times better than other calendars”, he concludes. “We're not there yet”.